Happy Birthday, Hisako! : Which part do you want to eat? Orland’s mouth, or eyes? 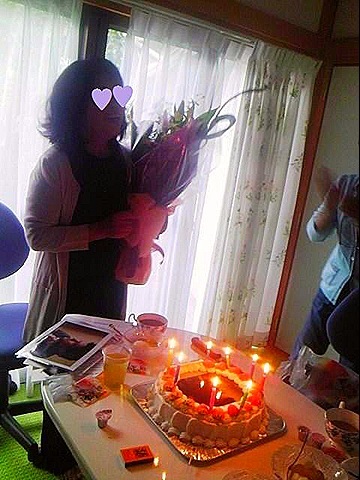 There is an English class on Thursday mornings at Hisako’s house, and Kazuko would have liked to have a birthday party for Hisako after the class on 13th. Actually, I do not take the English class at Hisako’s house on Thursdays because I have another class in the afternoon. I would be late to the afternoon class if I took the morning one or I would have to give up my lunch. But, of course, I would do anything for Hisako! I could give up my lunch! So, I decided to take the morning class that day. I have gotten a lot of things from her. She is a gentle and very hospitable person to anyone. I love her! And so many people do! That is why not only me but also all of the regular students of the Thursday class and the teacher approved Kazuko’s idea. Kazuko thought at first to have the party after the class, but we decided to have the party at the beginning of the class because some of the participants including me had a class in the afternoon and had to dash to the university as soon as the morning class was over. On the 13th, it was really hard to bring the birthday cake and that big bouquet – actually I was appalled at the size when I got it at the flower shop. It was three times as big as I had expected… － to her house without Hisako seeing them. Midori and I sneaked to the background with the flowers, saying “Feeling like as if we’re thieves…,” and hide them under the balcony. And then we went back to the entrance and opened the door, saying “Good morning!” as if nothing had happened. Kazuko ran up to us, when we entered the room, and whispered, “What shall I do? I couldn’t bring the cake into the house without Hisako seeing it. It is still in my car!” Midori and I explained how we had brought the bouquet to the balcony to Kazuko, and she decided to bring the cake with the same way. I went down to the path in the garden from the window and came near the entrance taking look around and hid myself behind the wall while Kazuko were saying to Hisako something why she had to go back to her car. Then, Kazuko returned with the cake from her car and handed it to me. I received the cake and went back to the window, where Teruko and Midori were waiting for me and they got the cake into the room. Just in case, I covered it with a table cloth. All of the participants were waiting for Hisako at the room, holding a cracker in each hand. She came without knowing a thing about the drama behind the stage. Everyone was trying to look innocent. The teacher greeted to his students and the class started. But it was not a usual one. He mentioned what day it was. 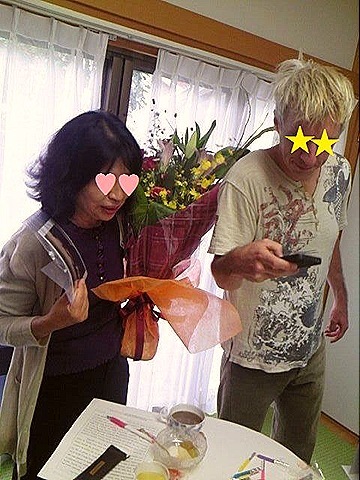 Yes, it was Hisako’s birthday! We said, “Happy birthday!” and let the crackers off all together. Hisako was very surprised and seemed not to understand what was happening. Some of us went to get the bouquet and the cake, and the party began. 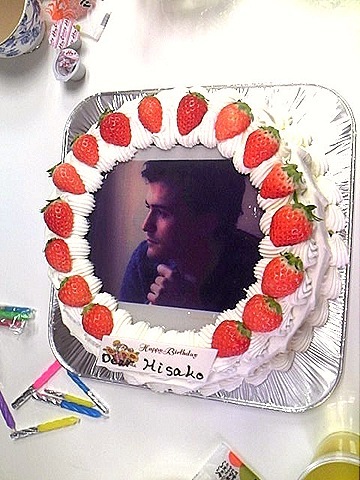 Not only Hisako but also all of the participants were surprised to see the birthday cake Kazuko had bought. It had Orland Bloom’s profile on the top. Is it edible? I thought. Of course, you can eat his cute face! It was printed with food colors on the chocolate. Hisako was really surprised and glad at the cake, exclaiming, “How did you know? How did you know?” Yes, Orland Bloom is her favorite! My guess was right. Kazuko also looked very happy to see Hisako’s pleasure, and winked at me. The day’s class was unusual. We studied English, eating delicious cake. Oh, I forgot to mention this: We had to cut Orland Bloom’s spotless face up to eat the cake… “Which part do you wanna eat, Hisako? Orland’s mouth?” Kazuko asked to Hisako. She replied, “Oh, I want his eyes!” So, Hisako ate Orland’s eyes part of the cake, and me his hand…Anyway, happy birthday, Hisako! The Taichi Training Camp 2011: Let’s Do Taichi for Health, Friendship and Peace! 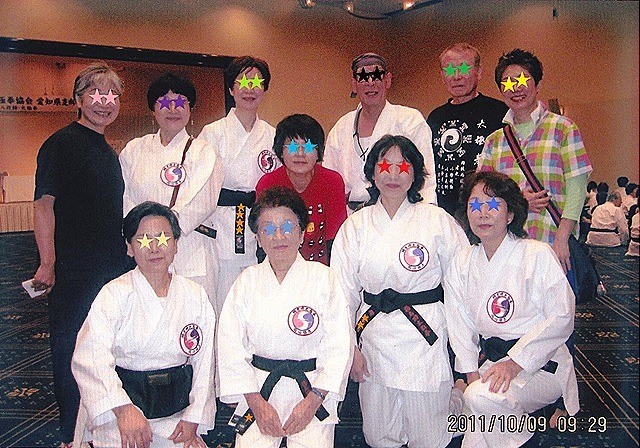 Have you ever done or seen Taichi? Actually, I do Taichi. 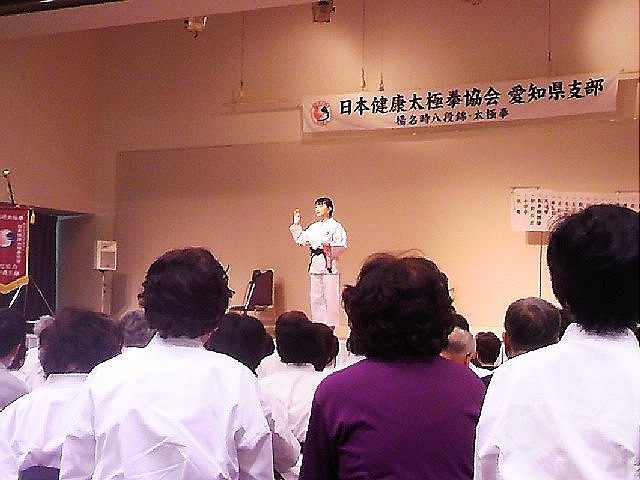 There was a Taichi training camp for Aichi Prefecture Branch of Yang Min Shi Taiji Quan in Toyohashi on October 8th and 9th, and I took part in it with a friend of mine, Fusa-fusa. She and I enjoyed doing Taichi and meeting some of our friends there. 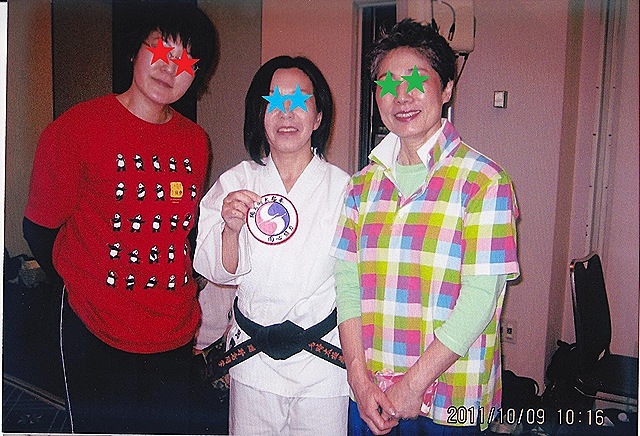 After she and I arrived at the hotel and changed clothes for doing Taichi, we went to a big room, which seemed to be usually used for banquets, when we met Miyuki there. “How have you been?! ” All of us exclaimed each other joyfully. We were roommates last year. And then, Yama-P joined there, who is also my friend. 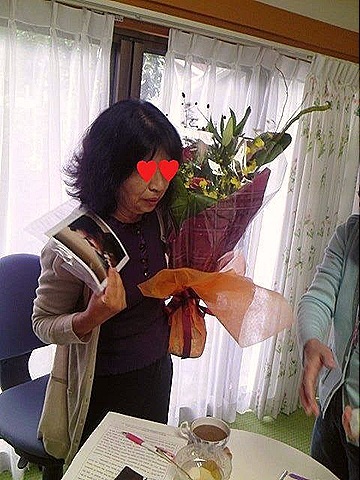 She came to the training camp for taking a test for certification of master. We four sat on the floor with other participants and had a lecture together. Fusa-fusa and I were in the same room, which was on the 22nd floor (! ), and had a great view from our window. After the lecture when we entered the room, there was a beautiful sunset out of the window. It’s difficult to find on this photo, but there are many windmills for power generation along the coast. Wind power generation will become more important and popular in Japan after the nuclear accident in Fukushima. 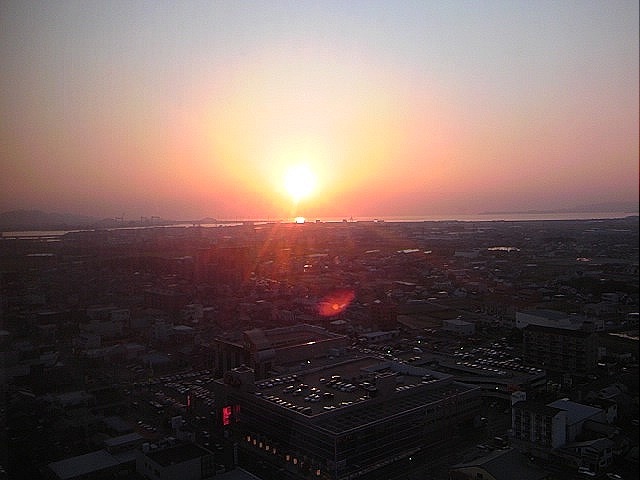 I couldn’t stop praying for peace in this world when I was seeing those windmills and the sun setting over the sea. 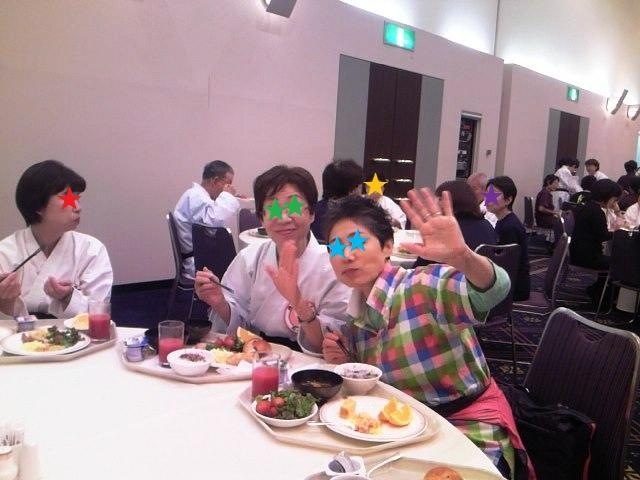 Fusa-fusa, Yama-P, and I were sitting at a table with some of the other participants. One of them was nearly 90 years old! He looked much younger than his real age and energetic! Another one came to the camp for taking a test for certification of master like Yama-P. Both of them were too nerves to eat much dinner. Poor thing. Actually, all of us at the table couldn’t eat so much because the food was not good, honestly…We poor thing! After the dinner, all of the participants listened to a talk between Master Nagamote and Master Kay. I didn’t know that Master Yang Min Shi had named himself “Min Shi” after he came to Japan from China, and the meaning of his new name is to become a history maker. So, he did! I went back to my room with Fusa-fusa, Yama-P, and Miyuki after the talk, and chatted for a while there. Yama-P went to her room because she wanted to rest earlier for the test next day, and Fusa-fusa, who is a color therapist, went to another room to consult some people. Miyuki and I went to a Starbuck’s near the hotel to have coffee. 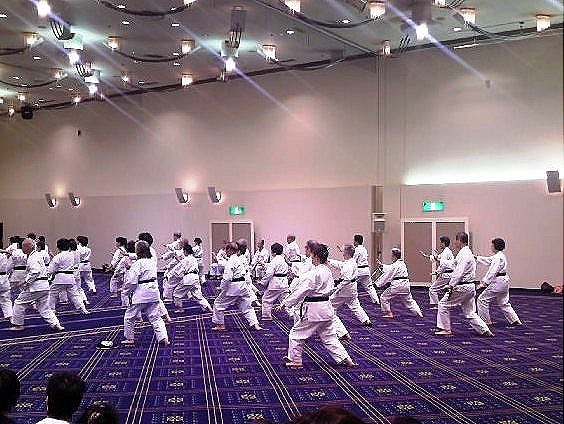 Actually, it was a quite unbelievable thing as compared to the previous hotel, in which the Taichi training camp had been held for past three years. Because the former one is located on top of the mountain near the sea and there’s no shops or restaurants nearby, people can’t go anywhere once they enter there… So, Miyuki and I enjoyed the night town a little. From 9:30 in the morning, we had a practice all together. And then, there was a test for certification of master. Yama-P said she was really nerves and I was sure she was, but she looked dignified and very elegant while doing Taichi before judges. Of course, she passed the test! Congratulations, Yama-P! After the test, teachers showed others doing Taichi. Their performance was great and really beautiful. When will I be like them? Yama-P , after the test, had a good appetite. We enjoyed having lunch together. The training camp was the fifth time for me, and I was able to have a happy reunion with some friends there. Unfortunately, it’s difficult to be roommates with someone I don’t know at the hotel unlike at the former one, whose rooms are usually for four people or five. That is, it’s difficult to make new friends at the Taichi camp anymore…The new place was nice for practicing all together, though, I felt a little sad…But it’s really wonderful to meet many people and do Taichi together! 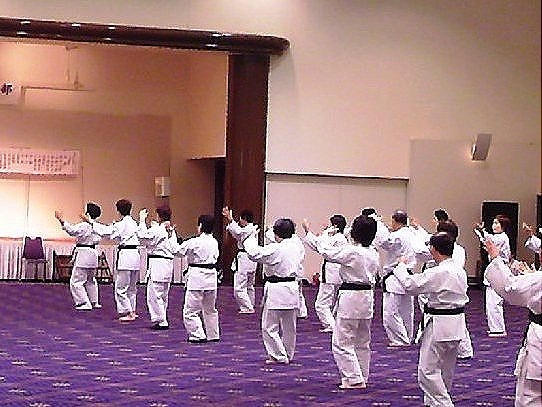 So, I’m looking forward to the Taichi training camp next year!